YoY higher Gateway Services revenue: Due to higher cargo volumes, flights and passengers handled. 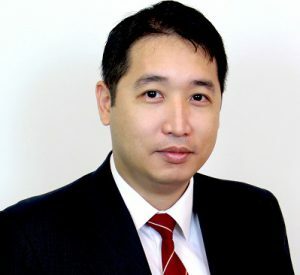 YoY growth in profit from associates/JVs: 89% YoY higher Food Solutions from a low base to S$3.4 million, and 16.3% YoY higher Gateway Solutions to S$12.1 million. 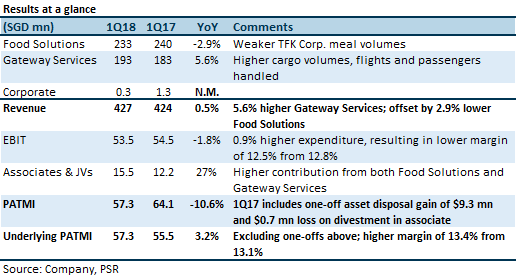 YoY lower Food Solutions revenue: Mainly due to weaker meal volumes at TFK Corp., arising from flight cuts by Delta Air Lines and Japan Airlines. This resulted in 11.0% lower TFK revenue. Non-Aviation Food in Singapore was also lower in relation to a major contract; this should be temporary. YoY lower operating profit: Due to 0.9% increase in expenditure out-pacing the 0.5% growth in revenue. There was an increase in licence fees arising from the cessation of fee rebates at Changi Airport. The outlook remains stable to positive. Key theme of air travel growth and demand for safe food remains intact. SATS will continue to reinvest capital in automation & technology, and in adjacent business lines through associates/JVs. Airlines are facing low yields, resulting in pricing pressure on SATS; but this may open up opportunities for SATS, as airlines could divest non-core businesses such as catering and ground handling. We do not make any adjustments to our full year forecast for FY18e. Our target price gives an implied FY18e forward P/E multiple of 23.2x. This compares against the STI next 12-months forward P/E multiple of 14.9x.